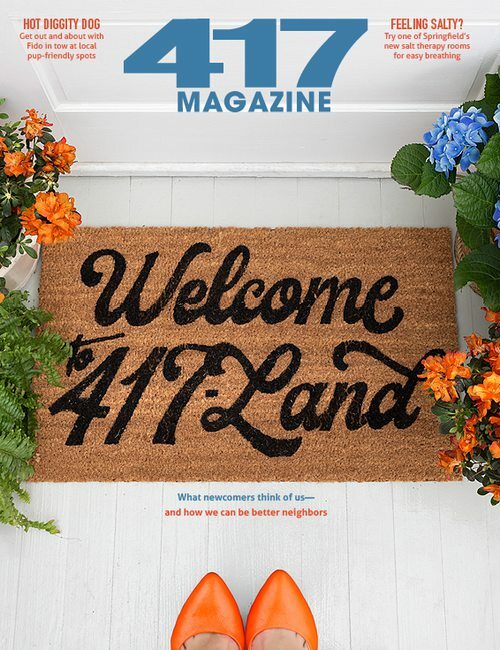 417 Magazine 417 Magazine Issues June 2014 Dive In! This is the largest outdoor pool in Springfield, and the 12-foot deep end, slide and two diving boards make it great for the older swimmers. A fenced-in splash area is reserved for kids 6 and younger, and shade structures provide a perfect spot to relax. Closed Mondays. Kids of every age enjoy this pool’s amenities. The younger ones love the interactive tree house spray structure while older kids get a thrill being plunged into the deep end on a huge corkscrew slide. They can also cannonball into the deep end on the pool’s spring board. Closed Tuesdays. This one is strictly for kids 6 and younger. A simple, shallow wading pool makes this spot perfect for introducing little ones to the water, and since it’s located next to Phelps Grove Park, pack a picnic. Admission is free. 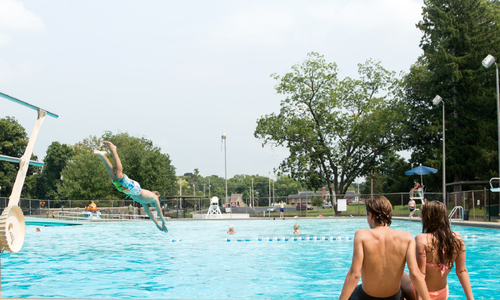 Meador is the least crowded of Springfield’s pools, and because it’s home to the city’s youth swim steam, the pool has two diving boards, lap swimming and concessions. Closed Mondays. Westport features a rock climbing wall on the pool’s edge, so when climbers reach the top, they can free-fall into the water. There’s also a zero-depth entry that’s great for the litte ones, plus spray features, drop slide, spring board and shade structures. Closed Tuesdays. Silver Springs might be a smaller facility, but it has plenty of amenities, including splash and spray water features, a drop slide, a spring board and even a water bench. A zero-depth entry and a wall that separates the shallow area from the deep end makes this pool great for kids. Adrenaline junkies love the surf simulator, and a speed slide and a corkscrew slide hurtle riders into the deep end. One- and three-meter diving boards offer an even bigger splash. Younger swimmers enjoy a play area with a swivel blaster and water buckets. A pool house, party area and concessions round out the aquatic center. Nixa’s Aquatic Center has a little bit of everything, including basketball hoops, two corkscrew slides, a one-meter diving board and six lap lanes Several floatables, a slide, zero-depth entry and tumble buckets help keep smaller children entertained. A zero-depth entry offers access for young swimmers and those with special needs. A resistance walk, therapy water seat and vortex pool are other features of Ozark’s Aquatics Center. Younger children can enjoy a fun play structure, toddler slide and water buckets. Bigger kids get a thrill as they fly down the 124-foot waterslide. Whether you’re climbing the new rock wall or shooting hoops, you’ll find plenty of friendly competition at this pool. Six lap lanes, a diving well and two huge water slides add even more activity. Youngsters can cool off in the leisure pool with a playground structure and toddler slide. Concessions, lounge chairs and a family changing room make this a great place to cool off with the family during the heat of summer. Sometimes you just want to close your eyes and float. The completely renovated Schifferdecker Aquatic Center is just the place with its new lazy river. Of course, there’s plenty of opportunity to play, too. There are lap lanes, a separate diving area, five slides, rock wall, play structure and spray features. Concessions can be enjoyed in the recently revamped eating area. The Cunningham Aquatic Center’s splash pad is just the spot for kids of all ages to cool off. The center’s pool has a play feature, zero depth entry and two large waterslides. A large shaded area is perfect for enjoying the available concessions. Three separate drop slides and a large waterslide make this the perfect choice for those who enjoy the flumes. Other features include a basketball hoop, kiddie area with play feature, lily pads, a zero depth entry and splash pad. Concessions are also available. Don’t want to worry about the sunscreen? A few indoor pools keep the fun going without the sunburn. A covered slide actually curves outside of the building before depositing riders safely into the deep end. 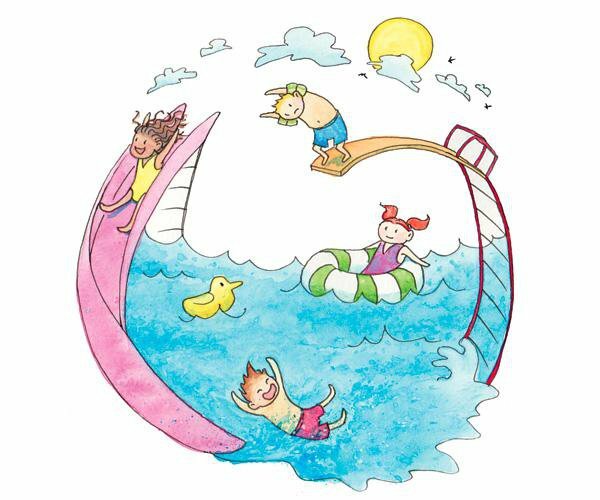 Kids also enjoy the pool’s fun splash features and the resistance current. The three-lane lap pool and hot tub are two of the adult favorites. A separated shallow area with zero-depth-entry is perfect for young kids. A dedicated “Little Splashers” swim time for kids 5 and younger is held during designated hours throughout the week. Springfield’s newest indoor pool, Doling opened last year on the city’s north side. It has a tube slide, splash features and a zero-depth entry for little ones. A basketball hoop over the water provides friendly and fun competition. Swimmers enjoy the separated lap pool, and everyone can appreciate the relaxing hot tub. For the youngsters, there’s a designated “little splashers” time for kids 5 and younger every Monday, Wednesday and Friday. Sunny days aren’t the only perk to summer. 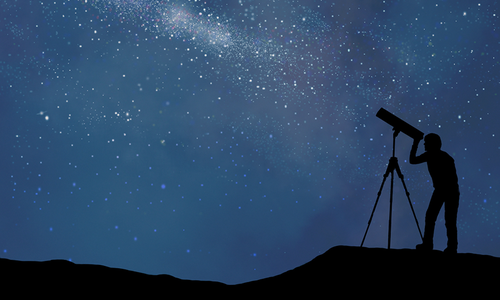 Warm nights provide the perfect opportunity to escape the city and see the stars. 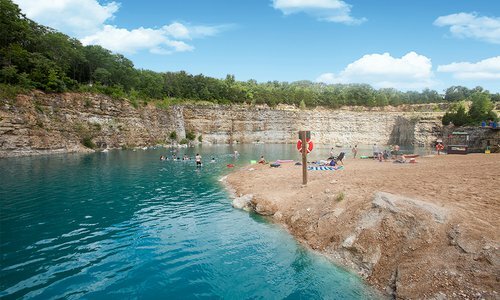 Round up your youngsters and beat the heat this summer at one of the cool pools around 417-land.